Give your brand a minimalist makeover with our Modern Basics sticker design template, a great choice for tech-related businesses, web developers and programmers, and any company that wants to showcase a cutting-edge philosophy. 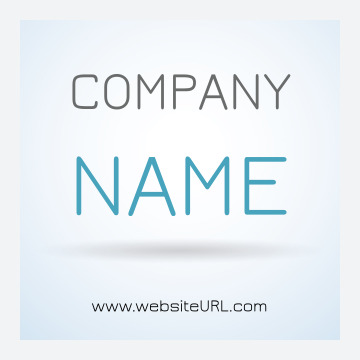 Available in five unique color schemes plus your choice of three shapes (circle, square, and rounded-corner square), Modern Basics prominently displays your company name, shadowed on a gradient background over your website URL. Personalize Modern Basics with our online sticker maker for a fresh new design that matches your brand today! PsPrint’s easy-to-use design tool is the fast, easy, and free way to print personalized stickers. You don’t need to hire a graphic designer to print stickers with professional designs – all you need is our point-and-click interface! Start by choosing your favorite color palette, then use the tool to edit text, layout, fonts, and even upload your own images. When you’re done designing, you can download a free PDF to get feedback before printing your stickers. Our premium paper stock and high-quality printing are just two of the reasons thousands of customers trust PsPrint to print custom stickers every day. We also offer custom printing options including foil stamps and die-cuts. No matter what you need, we’re here to bring your vision to life – satisfaction guaranteed! Stickers aren’t all we do! As your one-stop print marketing shop, PsPrint offers a wide range of tools you can use to promote your business, including business cards, banners, brochures, flyers, postcards, and more.